From the front of the choir: But I can’t sing that high! When you join a choir that sings in harmony, you will find that some parts are too high for you and some parts are too low. Just like Goldilocks, you will gravitate to the part which is “just right” — the place where you feel comfortable and are not straining your voice. But if you’re a beginning singer you might find that none of the parts feel right! This is because the range of notes that you can sing can be quite narrow at first. As you sing more regularly, you will find that you begin to reach higher and lower notes with more ease. However, even when you’ve been singing for some time, you might well come across a particular song that has a note that is outside your range, that you can’t sing comfortably or even can’t reach at all. What’s the problem here? It may be that you’re simply in the wrong part. When women first join a choir, they often go to the alto part because it’s not too high, and not too low. This is a safe place to be at first since it’s comfortably in the middle ground. Or they may end up with the sopranos because that’s what ‘proper’ women’s singing is like (more on this later). Sometimes people join a part because they reckon that it's the part that always has the tune. But in my kind of choirs, no one part consistently has the tune, and even if it did, they songs are not familiar in the first place so it is of no real advantage! I’ve known some women to stay in the ‘wrong’ part for several years before they realise that they actually have a far greater range than they first thought, or that they could sing much higher/ lower than they had imagined. Women with very low voices usually head for the tenor section. In most community choirs this is usually where the ‘low ladies’ live because it’s never really that low. But what about the poor blokes? They have only two options: tenor, which is usually too high for them, or bass which is often too low. So they get put off thinking they can’t sing properly or that they don’t have much of a vocal range. Trouble is, most men are really baritones which means that they hover somewhere between tenor and bass. In which case there is no real home for them, nowhere where they feel “just right”. what does ‘contralto’ mean anyway? I’m tossing these terms around like I know what I’m talking about: alto, tenor, baritone, etc., but what do they actually mean? And what about all those other terms that we might have heard of: mezzo-soprano, counter-tenor, bass-baritone? Actually, there are no absolute strict definitions of any of these terms. They are simply names which give an indication of the range of notes that a person singing that part is expected to be able to sing. A composer will bear this in mind when writing a choral piece (usually! ), but there is no exact agreement on what those ranges might be. It is simply an attempt to categorise the wide range of vocal possibilities out there. Since it is a generalisation, there will inevitably be some people who don’t fit comfortably into any category. There will always be a few male altos and female basses, for example. Very simplistically, the sopranos are the women with high voices, and the altos are women with lower voices. The tenors are the high men, and the basses are the low men. In classical music and professional choirs, the sopranos go really high and the basses go really low. Most untrained women are probably at the low end of the altos and won’t be able to hit some of the high alto notes. Most untrained men are baritones: they won’t be able to hit the really high tenor notes or the really low bass notes. 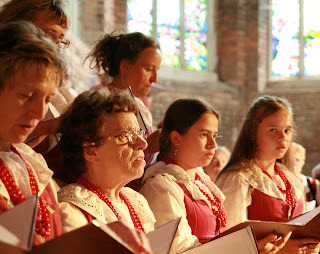 In most community choirs, songs are chosen and arranged to fit a smaller vocal range. In particular, the soprano part will never go too high, and most women will be able to get the lowest note of the tenor part (although not necessarily comfortably). Most men will be happy in the bass section because it won’t go too low. For those of you who are musically trained, in a community choir I tend to not go much higher than the D an octave and a bit above middle C, or lower than the G below middle C for women’s voices, and the same an octave lower for men. I usually find that everybody in the choir can cope with this range, so it gives people the flexibility to move around and try out different parts. When I’ve been working with a group for some time, I find I can cheat the high notes up (the highest I’ve gone up to so far is the G above the high D I mentioned earlier) for both women tops and male tenors (an octave lower). But I’ve only ever really taken the lowest note down to the F just below the G I mentioned earlier. Many people with a little musical knowledge come to a choir with preconceptions about voice types and vocal ranges, so try not to use technical terms like alto, tenor, etc. with a beginner choir, but just say tops, middles, low ladies/ high men, and bass. When you’re trying to find out which is the most suitable part for you to sing, it’s not just about which notes you can reach. During the warm up, the choir leader will gradually take you through a wide range of notes. Over the weeks you will often find that you will gradually be able to sing higher and lower than you first thought. As you warm up you will get a sense of which are the absolute highest and lowest notes that you are able to sing. You might be surprised! This will give you an indication of which part you sing. If you find it easiest to hit the higher notes, then you probably belong in the ‘tops’ (soprano for women, tenor for men). If you find it hard to reach the extreme high and low notes, then you’re probably a middle (alto for women, bass for men). And if you find the low notes the easiest, then you’re probably a low lady (tenor) or a real bass man! But this isn’t the whole story. I’ve mentioned the concept of tessitura in an earlier post (Everybody has a place in the choir). It basically means the range of notes that you feel most comfortable singing (i.e. without any kind of strain — your ‘sweet spot’) rather than the absolute range of notes that you can reach. As I pointed out earlier, with most community choirs, everybody will probably be able to sing any of the parts, but there will be one part that you feel most comfortable with. Many people come to singing with a huge number of preconceptions. When people say that they can’t sing at all, they usually mean they can’t sing as well as somebody famous, or they find it hard to reach the same notes as an opera singer, or that their voice doesn’t sound like their favourite pop star. You can read more about this in Why people think they can’t sing. Many women think that ‘proper’ singing is when you use your high ‘churchy’ voice. They think of opera singers with their soaring vibrato. So when they join a choir, they feel that they always need to be singing in their ‘choir voice’ which means just the high notes. At school they might never have come across their ‘chest voice’ which is more akin to our speaking voices, and is the voice that is used in a lot of traditional singing, especially in Eastern Europe. Because they haven’t used this part of their voice much, it might appear ugly or feel unfamiliar, so they stick with what they know. In some cases it might mean that a woman ends up singing with the tops even though she has an amazingly powerful low voice. For many men with low voices, there simply aren’t enough role models out there. I have a reasonable range, and can sing quite low, but never much liked the singing of Paul Robeson when I was growing up. I was much more attracted to pop music and voices like those of The Beatles or David Bowie. So I tried to sing like them and found that there was no way I could hit the high notes that they did, so I assumed that I couldn’t sing. Many men are in this situation. Most pop singers use their high tenor voice (and even drift off into falsetto like Thom Yorke, Tim Buckley, Rufus Wainwright, Antony Hegarty, etc.) and the most famous opera singers (like Pavarotti) are tenors. These ranges are usually beyond the reach of us mere mortals. Most men then think they can’t ‘sing’ properly or strain their voices trying to reach notes that are much too high for them. Even if they like the low voices you can find in opera or Russian singing, most men can’t get down there. There just aren’t enough role models out there for us baritones!